House Wydman（House Wydman） is a noble house from the Vale of Arryn. It blazons its arms with 5 splintered lances, 3-2, striped blue and white with blue pennons, on yellow, beneath a white chief bearing a red castle, a green viper, a black broken wheel, a purple unicorn and a yellow lion. Its words are "Right Conquers Might." House Wydman derives from a tourney in which the founder of the house bested five knights from the Vale and the Westerlands. 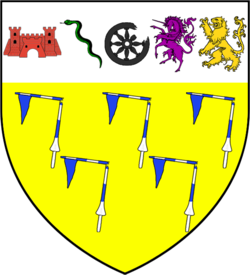 The arms of the defeated, which are displayed above the five broken lances of the Wydmans, suggest Houses Redfort, Lynderly, Waynwood, Brax, and Lannister. A noble displaying a broken lance is present in the High Hall of the Eyrie when Tyrion Lannister demands a trial by battle to prove his innocence of the claims put against him.